Gamblers is an enormously popular game in the U. S. and Canada, showcasing a dog’s willingness to work at a distance from his handler, and the dog’s skill at doing so. The objective is for the dog and handler team to accumulate as many points as possible in the point accumulation period and then to perform a designated distance challenge. The time allotted for the point accumulation period is 35 seconds for big dogs (12” and 16”) 38 seconds for 8” dogs and 41 seconds for 4” dogs. Time begins when the dog crosses the start line. The handler is allowed to lead out. The dog earns points for obstacles successfully performed. An obstacle can be performed only two times for points. The judge will call out the point value for an obstacle when it’s successfully performed and the dog earned the points for that obstacle. The point accumulation period ends when the timekeeper blows a whistle (horn), announcing the beginning of the gamble period. Back-to-back performance of any obstacle during the point accumulation period is allowed. Obstacles can be taken only twice for points during the period. The dog must at least be in the yellow on the contact on the down side when the whistle blows ending point accumulation to earn the points for the contact. Time begins when the dog crosses the start line. The timer will sound a whistle (or electronic horn) when the point accumulation time period ends and the gamble period begins. This closing period requires the dog to perform a series of obstacles in 15 seconds for big dogs (12” and 16”) 17 seconds for 8” dogs and 19 seconds for 4” dogs. The gamble must be performed in the direction and sequence indicated by the judge. The handler is required to remain behind the respective containment. If the gamble sequence is successfully completed in the time allotted by the judge, the dog will earn the points assigned for the gamble. Time will stop when the dog performs the last obstacle in the gamble. However, the handler may declare “Bonus” to attempt a bonus gamble (see below). The dog earns the gamble if he successfully performs all of the obstacles in the gamble in the order and direction indicated within the allotted time. The dog must have a successful gamble to qualify. loitering near the start of the gamble during the point accumulation period. The handler may direct the dog through the performance of a second gamble by declaring “Bonus” on the completion of the first. The dog shall retain the points for the first gamble whether or not the second gamble is successfully completed. If the first gamble is faulted the dog may earn the value of the second gamble so long as it is successfully completed in the available time for the gamble period. Gamblers is scored points then time. The team with the most points wins. Time is a tiebreaker only. The point system will be 1 3 5 7: Jumps = 1 point; Tire, tunnel, chute = 3 points; Contacts = 5 points; Weave Poles = 7 points. To qualify the dog must earn a minimum of 21 points during the point accumulation period and successfully complete one of the on-course gambles. The qualification criterion for this game was set for the TDAA Petit Prix, a contest that is run exclusively at the GIII level. In ordinary weekend competition the three gambles on the course will be set for each level of play. In a small trial that means that exhibitors at all levels can walk the course at the same time… so there is one briefing, and one walkthrough. The game is, you see, nested. GI – 18 points in the point accumulation period and successful completion of the blue square gamble in the course map. GII – 21 points in the point accumulation period and successful completion of the green square gamble in the course map. GIII – 21 points in the point accumulation period and successful completion of the red circle gamble in the course map. Gamblers can usually be nested neatly with a standard course to accommodate a minimum amount of movement of the equipment. However, the course designer might want to tweak things just a bit, and possible reverse the direction of obstacles that can be taken in only one direction to keep exhibitors from practicing a standard course that follows the Gamblers class. 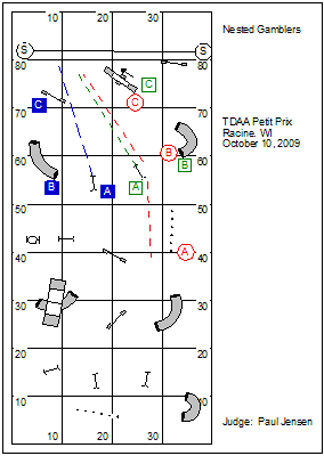 Note in this course design judge Paul Jensen put all three of the gambles towards the front of the ring and even used a common finish line. This design facilitates efficient conduct of the ring and an unambiguous focus for the time keeper. With apologies to Paul Jensen. 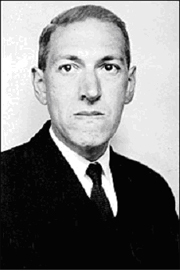 American writer Stephen King credits the fellow pictured here as a profound influence on the horror genre. Who is this person? First correct answer posted as a reply to this blog post wins a free copy of the February Jokers Notebook (or March, if you prefer). Questions comments & impassioned speeches to Bud Houston: BudHouston@hughes.net. Check out my latest publication the Jokers Notebook ~ Dog Agility Distance Training Plan – Feb 2010 available on the Country Dream Web Store: http://countrydream.wordpress.com/web-store/ . Readers of my web log get a discount: Enter “special02” in the box for the discount code. And that will take $5.00 off the price of the order. This entry was posted on February 19, 2010 at 12:21 pm and is filed under Agility for Small Dogs, Course and Sequence Design, Games and Courses, Go the Distance, Jokers Notebook, TDAA, TDAA Course Design College. You can follow any responses to this entry through the RSS 2.0 feed. Both comments and pings are currently closed. Howard Phillips Lovecraft – yes, I had to search for it 🙂 This one was a tough one, though. Thanks Bud, this begins to make some sense to me. You had posted one sometime ago, but I couldn’t quite figure it out.